Mas-issneun. The Korean fever in Singapore continues to heat up with the very first Andong Jjimdak restaurant at Raffles City. We may have seen this dish in Korean family restaurants locally, but this is probably the first eatery dedicated to this dish here. Spicy in taste, huge in portion, and great for sharing, Andong Jjimdak is a seasoned and simmered chicken dish that originated in Gyeongsangbukdo, Andong. I first had it at Myeong-dong during a cold winter day, and can always remember it for two things: the kick that it gave; and was almost impossible to finish by two grown adults. 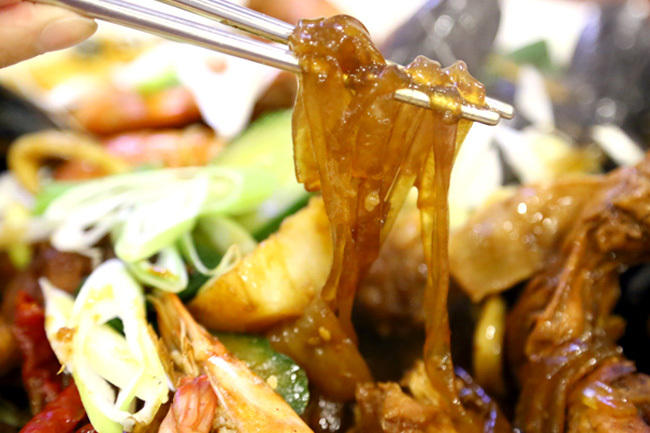 This popular Korean dish consists of chopped chicken parts, potatoes, onions, vegetables and sweet potato noodles, mixed with a spicy soy-based sauce and then simmered. 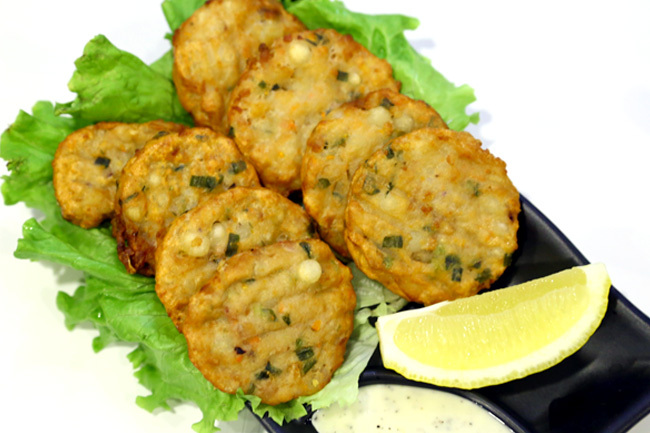 Fresh green chili pepper called “Cheongyang gochu” is added to provide that distinct spiciness. 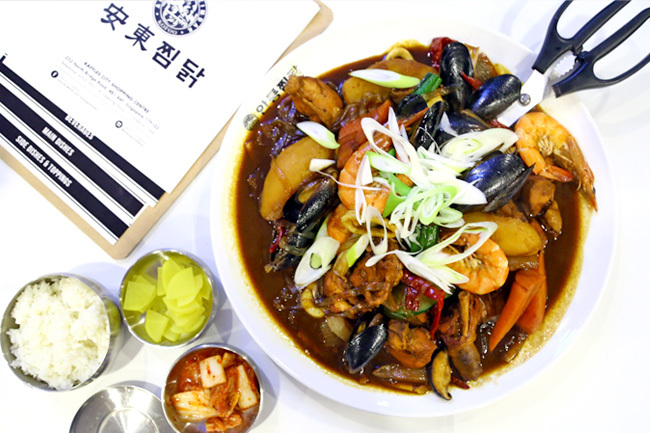 The menu is basic, with 4 varieties of Andong Jjimdak – The original ($40.90 for 2-3 pax, $50.90 for 3-4 pax), Boneless Jjimdak ($45.90, $55.90), Seafood Jjimdak ($48.90, $60.90), and Mayak Jjimdak ($42.90 and $52.90). The first three has the same base sauce, while the Mayak version is spicier and for those who love more fire in their food. Prices seem slightly higher here, as most Andong Jjimdak cost about 20,000 to 30,000 South Korean Won. When the plate arrived (very quickly within 5 minutes of ordering in a packed restaurant), I went “Wo Wo… So LARGE”, gaping at the ‘smallest order’ in the house. This was enough to feed 3 to 4, I think. 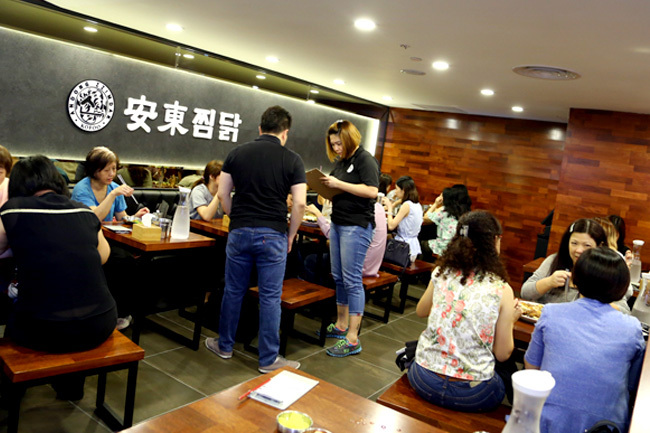 The Singapore franchisee kept to the serving portions as that was a requirement from the Koreans. This was still quite close to what I had – soft potatoes, sweet carrots, some tender chicken parts (not all) and chewy translucent noodles. The special sauce went extremely well with rice, though I kind of remember that the version I had in Seoul was spicier. So perhaps I should try the Mayak the next time. 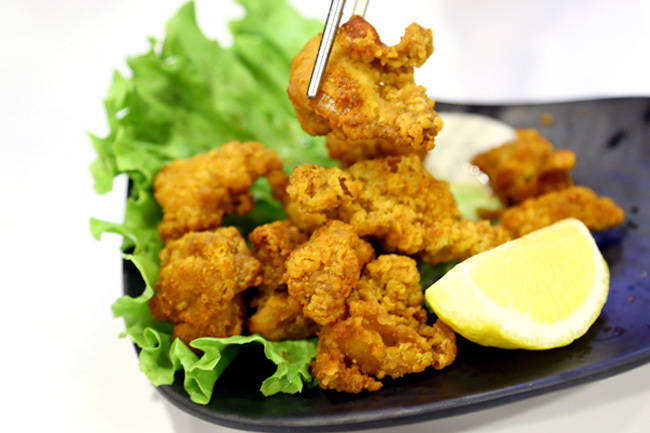 The side dishes include Chicken Karaage ($9.90), and Mini Seafood Pancake ($9.90). The former was crispy and not too oily, while the pancake felt too starchy after a filling ‘main course’. If I may say, the air-condition felt slightly warm though. 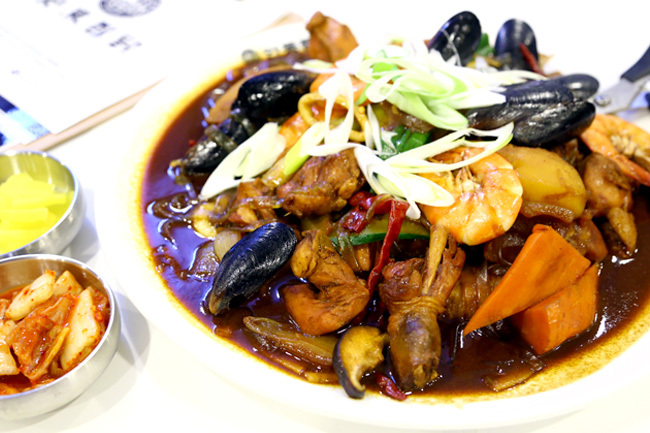 Otherwise, always good to have an authentic taste of Andong Jjimdak right here in Singapore, and this makes a comforting dish for groups to share.